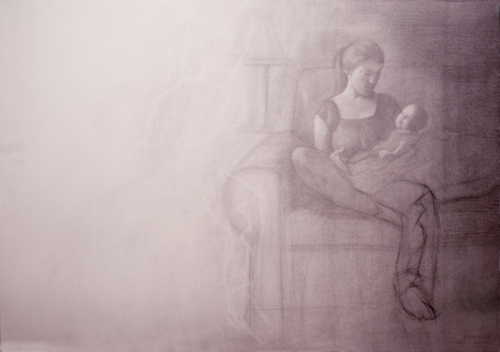 This drawing is part of a series I?m doing about people and their immediate environment. I try to draw people in the room they spend the most time in. This woman is the wife of the assistant pastor of our church. She spends most of her time with her baby son. This was drawn when he was a newborn. When drawing the two of them, my sketch time was dictated by his feeding schedule, hence the title. It struck me that this woman, who was working on her Masters of Anthropology before she became pregnant, was devoting her entire existence to this routine. In fact, she loved it, as far as I could tell. So I drew her fairly realistically, with a ghost-like, erased repetition of the two of them to the left.